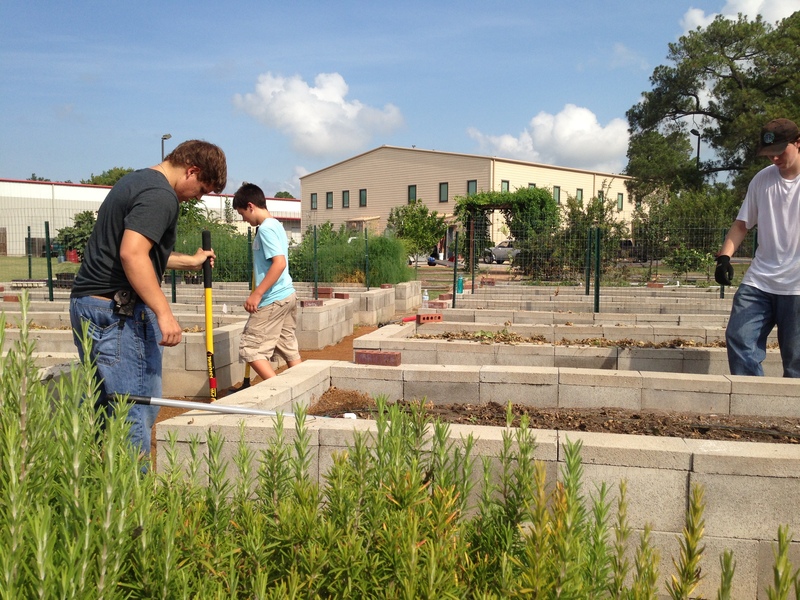 Several years ago, Kingsland invested in a Caring for Katy project that continues to bless people in need — the garden on the back lot of Katy Christian Ministries. Over the years, we have invested thousands of volunteer hours and thousands of dollars to help maintain this garden. The vegetables produced in the organic raised beds go directly into the KCM food pantry where they are distributed to people in our community who are struggling through hard times. Maintaining the garden takes a lot of work. Thankfully, the people of our community have taken ownership of maintaining the garden. 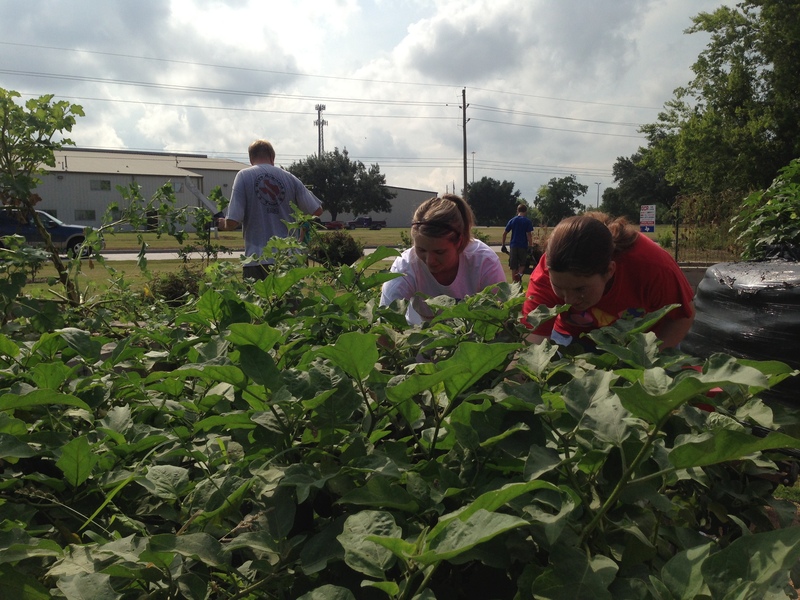 Every month, volunteers from area churches and organizations tend the beds, help to harvest the vegetables, pull weeds, and do various other things to keep the garden productive. 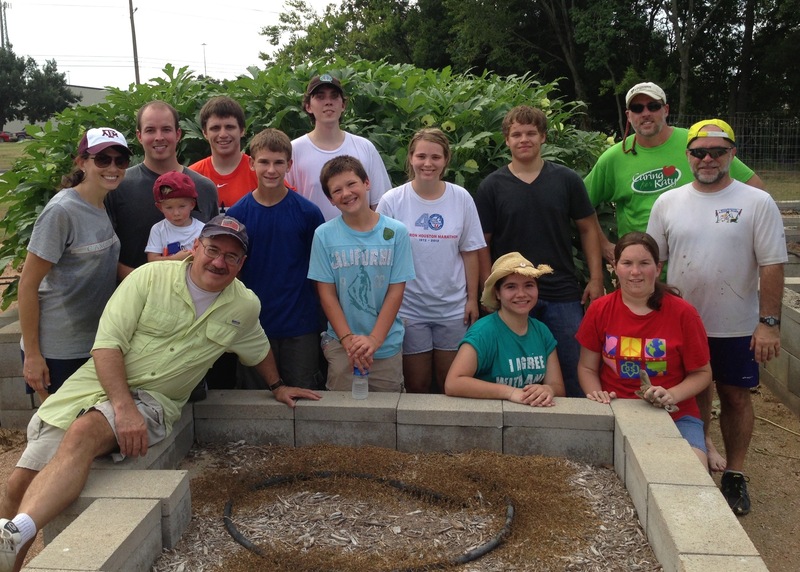 Yesterday morning, several Kingsland volunteers met at the garden to prepare the beds for the next round of vegetables. That meant removing the old plants, adding planting mix and manure to the beds, and tilling the soil. 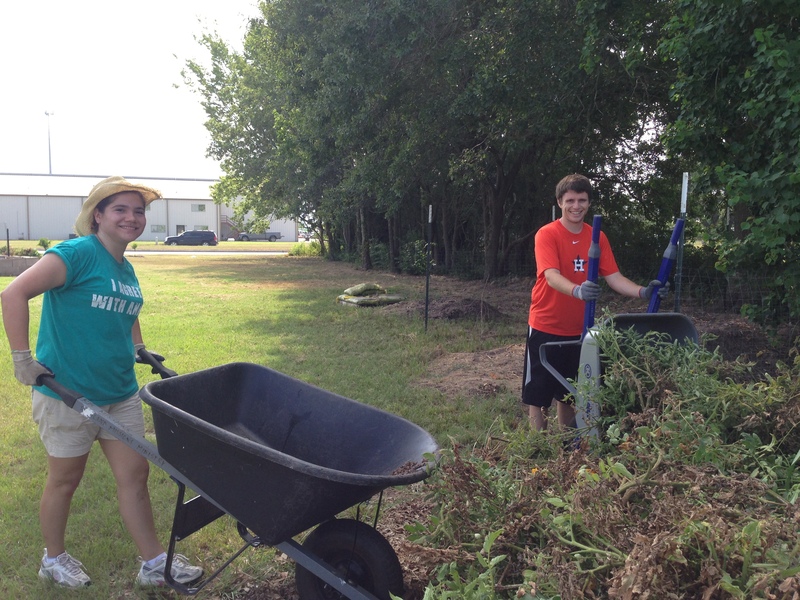 These tasks were made a bit more challenging because of the 100-plus degree temperature. It doesn’t take long working in the intense Texas heat to feel your energy ebbing away with every drop of sweat. In spite of the heat, our team managed to move four yards of crushed granite to maintain the paths around the planting beds. We also worked hard to prepare a dozen of the large planting beds for the next round of plants. After more than four hours of work, everything was ready for the next step. One of the master gardeners who volunteers at the garden will take it from here. Those who worked in the heat yesterday are at the front end of the blessing equation. We had a great time of fellowship together. We will, however, likely never see the people at the other end of our labor, those who will come to the food pantry and take home a bag of fresh vegetables to feed their families because we took the time to help maintain the garden that grows those vegetables. When it comes to kingdom metrics, we can’t always measure the impact of what we do. However, when we serve God’s purposes by caring about people in need and doing something practical to help, He notices. And, He can see the other end of the blessing equation and hear the “Thank you, Lord, for this food” kind of thoughts and prayers that are uttered by the recipients of a bag of groceries and fresh vegetables given in His name. That makes it worth building sweat equity in His kingdom in tough Texas heat. Hi Caprice … I still remember the day you came to me with the idea of the garden. Thanks for having a bold vision and for taking the steps to see it become a reality. The garden at KCM continues to bless so many people. Warmest regards and deepest thanks.